Flying solo with three babies, what’s the worst that could happen? 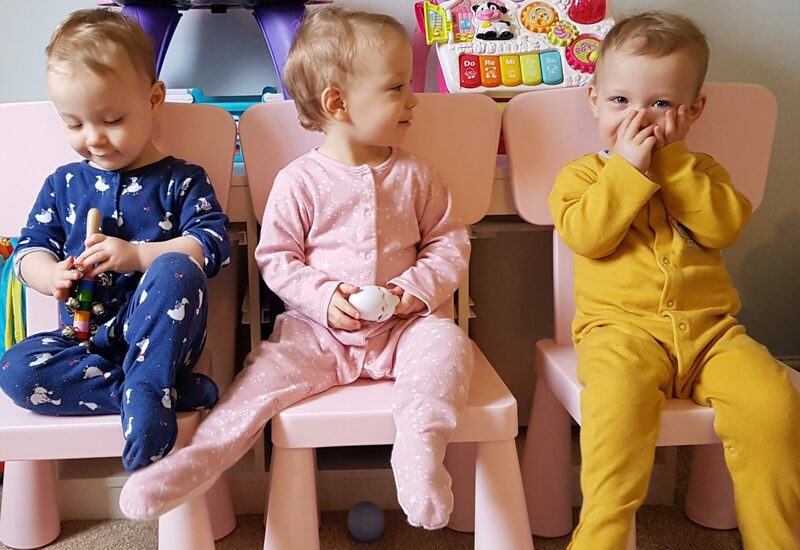 by Triplet Dad.In Home-life blog.Leave a Comment on Flying solo with three babies, what’s the worst that could happen? So far there have only been a handful of times that It’s been just the babies and me. And because of breastfeeding it’s never been more than a couple of hours. There has never been a problem and I enjoy those times. It means that Stacey and Frankie get some girl time away from the house. Every relationship is one that requires tending, so since the triplets arrival it’s nice for them to get a break, and Frankie loves having Mum to herself. So it’s a win-win all round. Today I have packed Stacey off to a spa for the day. She needs a real break from her routine. This means I will be covering feeds, including the lunchtime high chair messy one, the 4pm which will be breast milk in a bottle as well as the bath bottle bed routine. Unfortunately Frankie is a bit poorly so I will be taking the reigns for the most of today, and Stacey is obviously a little anxious about leaving me for so long with them for the first time. I however am ready for the challenge. I mean how tough can it be? I’ve been up with them since 5am already so they should be nice and tired for the day. 4pm – where’s the f*#king bonjela gone. 4.20pm – where did I put the f•#king paracetamol and why did I do this? 4.30pm- is that all the f*#king time is?! Dear God , give me all I need to get through this next hour and a half! But for the most it ran smoothly, the feeds went well, bath time was hassle free. We had play time and settled moments. The real intensity comes from the mental strain of remaining switched on to an unpredictable, constantly changing situation. Although my work is physical and tiring in that sense, I also have the privilege of a lunch break. I absolutely understand why some nights I walk in from work and my wife is exhausted, sat at the bottom of the stairs waiting for me with her head in her hands. Don’t get me wrong, I’m hands on with these babies as much as possible. My life is work and babies, there is no social life. Nor am I the type of husband who thinks my wife has it easy because she’s home all day. I am aware of Men who’s day is done when they walk through the door, I’m personally not that selfish. My wife went through hell to bring our girls into the world, it’s my job to knuckle down and support her when i’m at home. So respect where it is due. My wife will be going more often, she deserves it. And I’m glad I spent a day in her shoes. I think all Dads need to step up to this one.